How does the A10-U8 work? 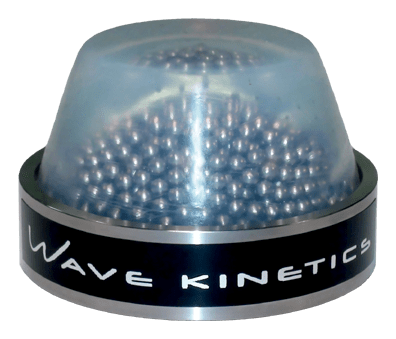 The WAVE KINETICS A10-U8 Component Control System is a revolutionary product incorporating state of the art materials and technology. The A10-U8 is designed to provide a stable structure while still allowing for damping and vibration control. When the system is at rest, the A10-U8 behaves as a solid slug with thin compliant top and bottom caps. The weight of the component applies force to the top of the A10-U8 which then compresses a spherical bearing array. The bearings align into a hexagonal packed structure held in place by the compliant walls of the container. The walls of the container are soft and thin providing virtually no solid path for vibration to travel from stand to component. At rest, it is as if the component is sitting on a narrow stack of very dense metal bearings with a thin compliant surface on top and bottom. There is no rigid path for vibration transfer, yet the component sits on a stable surface! What types of vibration are treated by the A10-U8? Vibration energy transmitted through the floor or air introduced to the component stand will corrupt musical playback if allowed to reach the component. Sensitive mechanical components and electronics will perform more poorly in the presence of vibration. The A10-U8 greatly attenuates (-30dB ) the transfer of vibration energy from the stand to the component. There are several mechanisms responsible for this amazing attenuation. First, the extremely hard base cup material interfaces with the extremely soft and compliant retaining structure. This causes a large impedance mismatch and reflects vibration back toward the stand. Second, vibration that is transmitted through the impedance mismatch excites minute motion in the spherical bearing array. A combination of extreme density, geometry and coulumb frictional forces cause the spherical array to settle incredibly quickly. Further, the walls of the containment structure proved further damping of the bearing array. Vibration is essentially eliminated as the thousands of bearings vibrate, moving against each other creating friction losses, and react with the walls of the soft container. Finally, any vibration that makes it to the top of the bearing array must again cross a dramatic impedance mismatch before entering the component. When a component is in the same room as loudspeakers, airborne vibration strikes the component directly, bypassing the component stand. This airborne energy can excite resonances in the component chassis, and even components within the chassis. The unique material on the top of the A10-U8 absorbs vibration energy across a wide frequency band helping to dissipate the energy in the chassis. Larger amplitude vibration is transmitted into the A10-U8 Component Control System and is dissipated by the spherical bearing array as described above. Even if airborne vibration and vibration transmitted from a stand is mitigated, the component itself is a source of vibration. Mechanisms inside the component such as transformers, CD transport mechanisms, reading head mechanisms, turntable motors and components, and even some circuitry can generate substantial amounts of vibration. The soft top of the A10-U8 forms an excellent interface with the bottom of the component. This interface serves two functions. First, it creates a path for energy to flow into the A10-U8 and be dissipated as described above. Second, the interface allows rotational energy such as nutating CD transports, and turntable mechanisms to be damped directly. For example, a CD drive mechanism may rotate at 20-30 Hz. If the drive mechanism is not perfectly balanced or if the printing on the CD is not perfectly symmetrical, the rotation will induce a vibration which will in turn shake the entire component. The soft attachment interface with the A10-U8 effectively damps this type of vibration directly. This specific mode of vibration damping was optimized for rotational and lateral vibrations as encountered in CD transports and Turntables. The A10-U8 Component Control System is also effective at damping other vibration energy generated by a component. What are the benefits of using the A10-U8? By combining state of the art techniques, the WAVE KINETICS A10-U8 Component Control System isolates audio components from vibration transmitted through equipment stands, and lessens the effects of airborne vibration and component-generated vibration. The effects are both measurable and audible. When placed under a state of the art CD player sitting on a state of the art rack system the A10-U8 Component Control System substantially reduced harmonic distortion by greater than 75%. This translates to a dramatic improvement in sound. You will hear increased naturalness, tighter more tuneful bass, greater clarity and detail retrieval, more pinpoint accuracy and placement within the sound field, wider and deeper soundstaging with much more control especially at louder listening levels. The A10-U8 Component Control System works under a wide range of component weights. They will improve the sound of components sitting on even the best rack systems because they deal with airborne and component generated vibration – areas where rack systems are traditionally weak. Further, the use of the A10-U8 in conjunction with a mediocre rack system or even traditional furniture can work miracles. The WAVE KINETICS A10-U8 Component Control System renders expensive audiophile racks completely obsolete! Made for amplifiers, preamplifiers, phono stages, digital playback devices, turntables, power supplies and video equipment.